We often hear that people think Portland is so far away from our lovely location and they worry about lodging accommodations for their guests. The reality is it’s only about 30 miles! In addition to our close proximity to the city, we are nestled the beauty of wine country with so many of our own great lodging options. In order to make things perfectly simple for you all, I’ve created a list of some of my absolute favorites. So, no more excuses! P.S. These are also great wedding night/honeymoon options to consider. 1. 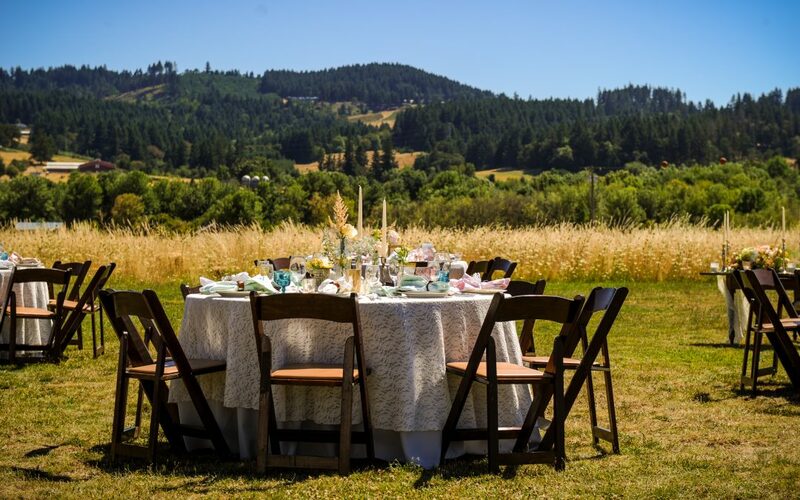 The Allison Inn and Spa: The award winning, wine country lodge is located in Newberg with views that welcome every guest to enjoy the beauty of the valley. Complete with gorgeous grounds for leisurely strolls, plush rooms for a much needed rest, a relaxing spa and one of America’s Top 100 restaurants, The Allison Inn and Spa is simply amazing. As if that wasn’t enough for you to book your stay, they also host a Creative Dog program for the furry friends in our lives. Your guests will leave there as blissfully in love as you. 2. McMenamin’s Hotel Oregon: Downtown McMinnville plays host to this 1905 historic hotel. Once a Greyhound bus depot, beauty parlor, and much more is now part of McMenamin’s historic hotel legacy. For guests that enjoy being close to the action, this is the place to stay. Enjoy the hustle and bustle of downtown from the rooftop bar featuring 360 degree views and a variety of craft beers. Don’t forget your pets, they are welcome here too! 3. Inn at Red Hills: Located in the heart of the Willamette Valley with easy access off of Hwy 99 in Dundee. The Inn at Red Hills showcases boutique inn style lodging for a cozy and relaxing stay. Guests can partake in wine tasting and dine at Babica Hen where quality ingredients are key. The combination of casual and elegant will allow your guests to enjoy your wedding and feel like they are on vacation too. 4. Best Western/Shilo Inn: Conveniently located right off Hwy 99 in Newberg, the Shilo Inn is perfect for families. It’s budget friendly, offers free breakfast, an outdoor pool and sauna, and allows pets. The location is also within walking distance to many restaurants and local shops. 5. Le Puy: This beautiful B & B is located in the Dundee Hills outside of Newberg and offers a stay promising peace and tranquility. Catering towards a romantic stay for couples the 8 room inn is deeply connected to nature. Your wedding guests will surely find comfort at this 10 acre, eco-friendly bed and breakfast. Special bonus: It’s only one mile from our venue! 6. Chehalem Ridge Bed & Breakfast: Enjoy the views on Mountain Top Road in Newberg as you sip wine on the beautiful grounds of this B & B. Capturing the spirit of Oregon in their 5 rooms, guests will begin to understand why this state is so great. As an additional treat, guests are served a gourmet, seasonal breakfast before they venture out for the day. 7. Black Walnut Inn & Vineyard: Boasting breathtaking valley views, located in Dundee, this European style villa is truly a labor of love from the Utz family. Hosting 9 beautiful rooms, offering an exquisite breakfast and morning newsletter with daily outing recommendations, guests will feel the love on this 42 acre property. 8. Abbey Road Farm Bed and Breakfast: Located in Carlton, your guests will enjoy the charm of the “Silo Suites”. Three converted grain bin silos have be transformed into an incredibly lovely and unique B & B. Featuring 6 rooms with one of them being a ranch house (3 bed/2 bath), a garden and orchard and an incredible farm to table breakfast your guests are sure to love. 9. VRBO: Head over to their website to find a plethora of listings for vacation rentals. Listed by property managers and owners, these online classifieds for are a great alternative to a hotel. Your guests can often rent a home for less than a hotel stay or choose to share a large home with another group and save even more.